…well not at my dinner table. No, I’d much rather see a Pheasant as a guest feeding at the dinner table I have in my garden for the ground feeding birds like Blackbirds and Dunnocks. I am sure they wouldn’t mind an extra party guest seeing it is the season of good will. Although I’m not quite sure what they would make of it. They were confused enough with the squirrel eating at this table! 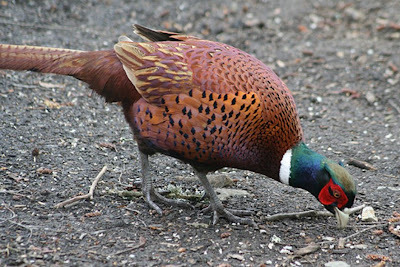 The Pheasant is not a regular visitor to my garden but this morning as I caught up on replies to my previous posting one landed on my lawn outside my window. This is the second time I have ever seen a visit like this in the last 17 years we have had this garden. I should perhaps stress that I am a quite a few streets away from any open countryside or woodland. I watched it follow the edges of my lawn. Unfortunately, for it, it didn’t find its way to the wilder areas where I scatter food. Instead it walked the length of my lawn and around the back of my arbour. I suspect it would have gone under my hedge and out of my garden as when I went quietly out with my camera it was nowhere to be seen. Ah well… maybe next time. How spookily seasonal was the timing of this visit? The photo above was not taken in my garden. It was taken at Nature Reserve Loch of the Lowes in March 2008. How lucky to have one of these handsome brutes in your garden. Doesn't it just make you wonder where it came from?? I wonder if someones Christmas dinner got away? What a lovely Christmas surprise that was. Maybe a Partridge will be next but of course you will need a pear tree to accommodate that!! They are beautiful birds - but they have to be the most stupid too. I recall last spring one rather hormoned-up male taking umbridge at OH's car, and trying to attack it whilst it was parked in the Lane! They are rather stupid - but I love watching them - one of the gardens that I work in has about 4 that come to feed morning and afternoon regular as clockwork - they are beautiful. But I do wonder where yours came from Shirl! ?? Karen – Once again, I had no idea they were lacking in grey matter ;-) Although this one must have used some to get over my hedge in the first place! Wow... four coming to a garden to feed must be fun to see. It really would be fascinating to see one feed with the Blackbirds in my garden but I doubt we will see it again far less regular visits. I can only guess that the building of a school about a seven minute walk away has disturbed it from the fields and woodland around it.